Anthem Sues Express Scripts For A Bigger Slice Of Drug Savings : Shots - Health News The giant health insurer says Express Scripts, a manager of drug benefits, should be passing along more of the savings it negotiates with drugmakers. Indianapolis-based Anthem wants Express Scripts to cough up more of the rebates it gets from drugmakers. The battle over drug prices escalated Monday when health insurance giant Anthem Inc. sued Express Scripts, a manager of drug benefits, to get a bigger share of savings on prescription medicines. Anthem is looking for a change in its contract with Express Scripts, which handles drug benefits for 80 million people. The insurer says it's overpaying for pharmaceuticals and not benefiting from rebates the pharmacy benefit manager has negotiated with drugmakers. 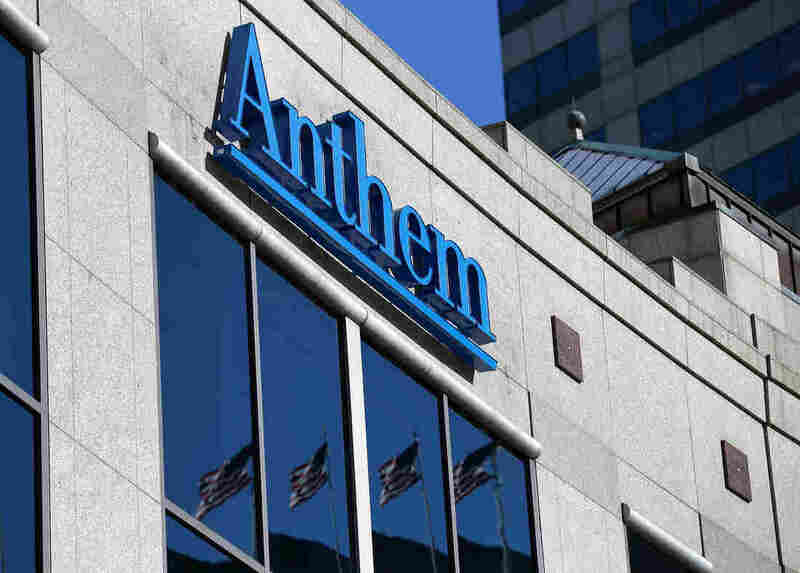 Anthem's CEO Joseph Swedish said in January that the company could save as much at $3 billion in drug costs by reworking the deal with the PBM, according to several news reports at the time. Anthem is now threatening to end its contract with the country's largest pharmacy benefit manager if it doesn't get the price breaks it wants. Express Scripts contests Anthem's assessment. "We do not believe they are entitled to $3 billion," Express Scripts spokesman Brian Henry tells Shots via email. Drug prices are among the most opaque aspects of the muddled health care industry. Almost nobody pays the retail price for prescription medications. Pharmacy benefit managers like Express Scripts contract with health insurers or directly with employers to administer the prescription portion of employees' health care plans. The PBMs then negotiate prices with drug companies for medications. When patients go to a drugstore, they usually pay a set copayment for their medicine and the PBM pays the remainder of the discounted price — which shows up on insurance records. But those discounts are often supplemented with rebates from the pharmaceutical manufacturer to the PBM that are often invisible to patients and to insurers or employers. Express Scripts boasts about the discounts that it has extracted from drug companies that it passes along, in part, to its clients, such as Anthem. In recent years, Express Scripts has been driving harder bargains, sometimes refusing to pay at all for popular brand-name medicines and steering patients to rival drugs from companies that offer the PBM better deals. Prices of brand name prescription drugs have climbed 164 percent since 2008 while generic drug prices have fallen 70 percent over the same period, according to Express Scripts' own report. Anthem used to run its own PBM but sold it to Express Scripts in 2009. As part of the deal, Anthem agreed to use Express Scripts for 10 years. The contract, however, called for the companies to renegotiate prices last December. In its lawsuit, filed in the U.S. District Court for the Southern District of New York, Anthem says Express Scripts has refused to negotiate in good faith. Anthem is asking for damages to compensate the insurer for overpaying for prescription drugs. "We believe that Anthem's lawsuit is without merit," Express Scripts said in an emailed statement, adding that the company "has consistently acted in good faith and in accordance with the terms of its agreement with Anthem."